Having rocked their way through four summer tours over the last four years, it sounds as if British rockers Def Leppard may be ready to take a little time off and concentrate on other activities for a while. 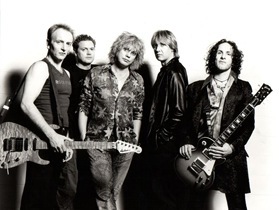 The group has toured in recent years with a diverse group of acts including, Journey, Foreigner and Bryan Adams, which likely created a nostalgic blend for middle-aged concert goers who can remember cruising in their cars a couple of decades ago with the sounds of these bands blaring from their stereos. As for the group’s decision to team up with Poison for this year’s tour after a public spat between the two groups a while back, it was kind of a surprise to hear that they would be sharing a stage this summer. According to Elliott, however, the whole incident was a misunderstanding that was sparked by something that was taken out of context by a foreign journalist, and Poison’s Bret Michaels, who was in the center of the controversy, understands that. Def Leppard’s decision to take a break from touring may not be all bad for dedicated fans. Elliott says he may use the time off to write some music and begin making preparations for a new album. This is probably due to his desire to keep moving the group forward and making new music. “I can’t live my life with my past being my future, just going out there and consistently playing some kind of nostalgia show," he said. "I have to be able to walk on stage and say, ‘This is a song from my new album,’ or I can’t do it." For more check out Yahoo! News.